Danish nisse are gnomes who secretly live in your attic, or barn if you live on a farm, and help take care of the animals at night when you are asleep. They also protect your family from harm. All these helpful creatures ask for is respect and a bowl of porridge with a pat of butter on top on Christmas Eve, otherwise they will get even by playing tricks on you. Can’t find your car keys the next day? A group of insulted nisser probably hid them! Many Danish home decorate for Christmas with nisse (also called tomte) or as we call them in the United States, gnomes.The plural of nisse is nisser and they are pretty darn cute as well as helpful! Let’s make some Christmas gnome decorations from recycled wine corks! Tomte like it when we recycle. 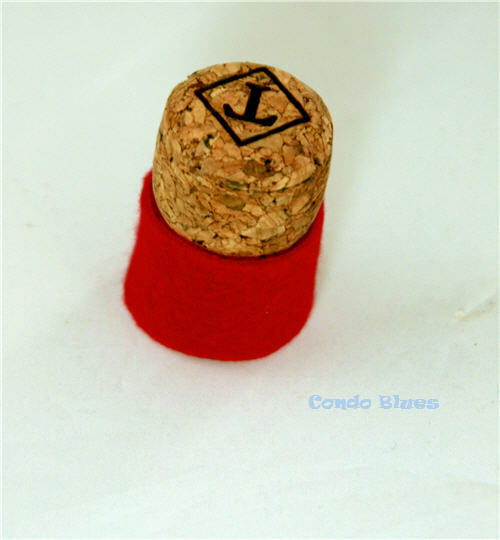 Reycled Wine Cork Craft Idea: Christmas Gnomes! 1. 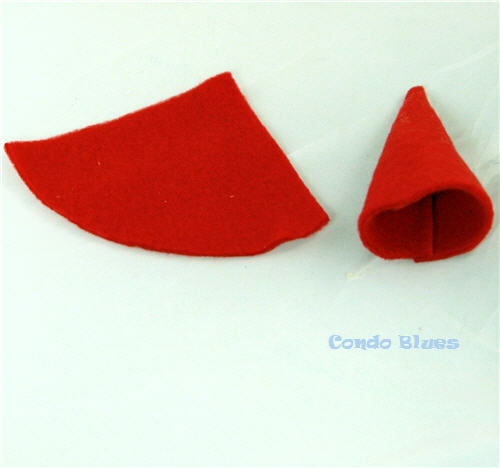 Use the scissors to cut a triangle for the hat and a rectangle of fabric for the nisse’s hat and clothing. 2. Roll the triangle fabric into a cone and use the tacky glue to glue it in place. Allow the glue to dry. The size of the triangle will depend upon the size and type of wine cork you use. I made mine larger because I am using champagne and cider corks for this project. 3. Wrap the small rectangle around the bottom of the wine cork and glue it into place. We don't want any naked nisser do we? 4. Cut several small lengths of white cord (I eyeballed mine) and unravel the cord to make hair for the girl tomte and a big bushy beard for the boy tomte. Tip: I cut the cord a little long than I needed to allow me to play with the placement. I gave my nisser a hair cut and beard trim in a later step. 5. Fold the unraveled cording in half and use the tacky glue to glue it onto the sides of the wine cork for the girl nisse and to the front for the bushy beard of the boy nisse. We'll tame the fly aways and frizzes in a later step. 6. Make the boy niise’s nose by rolling a small bit of cotton ball or batting into a ball, covering it with a small circle of fabric and tying it into place with a bit of cord. Trim away any access fabric and use the tacky glue to glue it into place. 7. Once the glue is dry, it is time to finish (or should I say Finnish?) your nisser! Tie the female nisse’s hair into pigtails with the baker’s twine and give her hair a little trim if desired. Use the black marker to add eyes to the front of the wine cork. Arrange the male nisser’s beard around his bulbous nose and give him a beard trim if desired. 8. 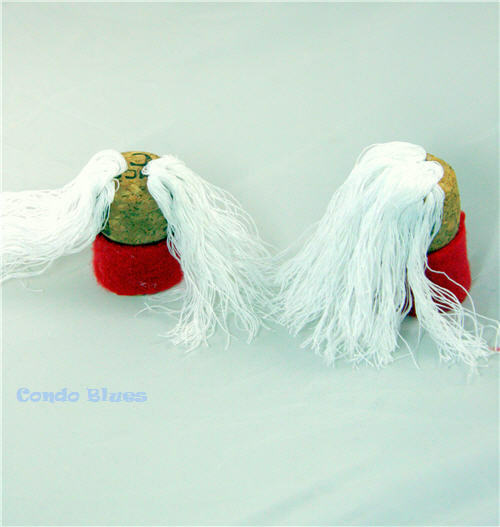 Glue each nisse’s hat into place and allow the glue to dry. That's Danish for Merry Christmas! 9. 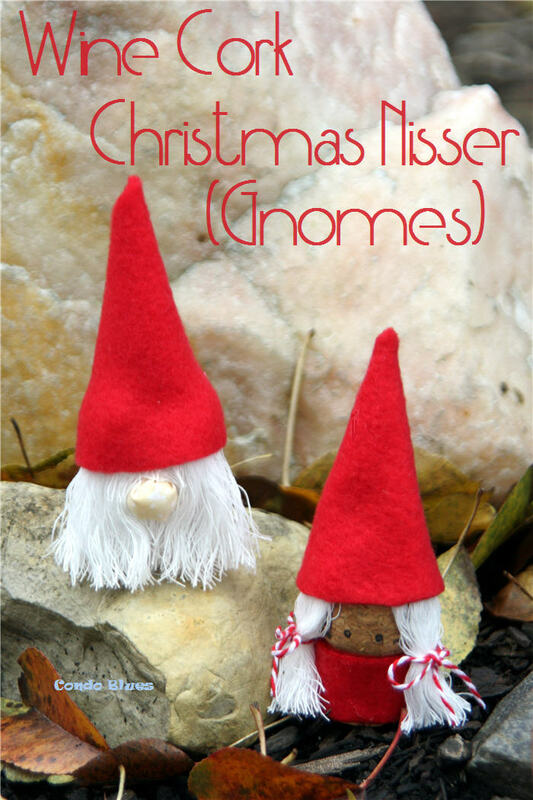 Display your nisser proudly and remember to put a bowl of porriage with a pat of butter in your attic for the tomte on Christmas Eve. You don’t diss the nisse! Pin this idea to make later and to share with your friends!